At the beginning of January, I went on a trip to Malaysia. After a meeting with the central government’s officials in charge of water resources development in Kuala Lumpur, I headed for Johor Bahru, in order to give a presentation about Japanese technologies to the officials of the local government of Johor and the water experts of the University of Technology, Malaysia. I happened to stay at a five-star hotel in Kuala Lumpur, and I was astonished by something there. That was the performance of a Japanese water-related enterprise. This is not a large plant maker, but a maker of toilets. The toilets in that hotel were shower-type ones, which are different from those seen in Japan. They are not controlled electrically, but manually with a screw. When you turn the screw, the toilet shoots controlled jets of water. It does not use energy, but the water pressure in a water supply pipe, to wash the buttocks. I was astonished by the efforts of the enterprise that localized the specs of Japanese standard shower-type toilets. However, the Japanese-style toilets have not been distributed sufficiently around the world. I think this is because there are few customs of washing the buttocks with water. Also, water itself is valuable in many countries. I remember that there had been no toilets that washed the buttocks with water in Japan, either, until around 20 years ago. Such toilets have been recently become popular in Japan in a short period of time, and they are now must-install items in buildings. Washing the buttocks with water is common in Muslim countries. A thin hose is hung on a wall beside a toilet. Users grab it from the wall, and wash their buttocks. This hose is not easy to use. This is not because I am a Japanese. It seems that is difficult also for people in Muslim countries and the floors of most restrooms are wet. Therefore, cleaning staff often wipe water from the floors with a mop. It was expected that Japanese toilets would be distributed in Muslim countries, where there is a custom of washing the buttocks with water. However, it seems that Japanese toilets have not been popularized there. One of the reason is that the specs of Japanese toilets are too advanced, complex, or high level. Some Japanese toilets even open and close their lids automatically, as the door of a stall is opened and closed. I remember that I was startled to see the lid of a toilet opening automatically. Such excessively advanced Japanese toilets have been transformed into simple mechanical ones and adopted by hotels in Kuala Lumpur. That Japanese maker modified the specs according to the situation in Kuala Lumpur. This means the localization of specifications. I was impressed by the Japanese technologies pleasing people around the world. After-sales maintenance services are indispensable for distributing industrial products. If the specs of a product are too advanced and complex, a maintenance system that can meet such specs is required. The reason why Japanese toilets that can wash the buttocks with water have not been distributed globally is probably because their specs are too advanced and maintenance systems for them have not been developed. That maker overcame the problem, by localizing the specs. Assuming that the level of Japanese specs is 100, that maker reduced the level to around 20, and made efforts to localize the specs thoroughly so that their toilets could be maintained there. Once this is adopted, the toilets could be maintained easily in any country. Through the international cooperation for water, I feel that Japanese specs are excessively advanced. For instance, even though the Japanese water treatment plants and machinery were once installed in developing countries through ODA, due to the lack of developing a concrete maintenance system which fits into the needs of the local market, it has been left without any additional support and gradually end up being forgotten by local people within several years. The figure below shows how the technological level of Japan has increased. From the Meiji Era, Japan has absorbed European and U.S. technologies. Then, Japan combined them with Japanese traditional technologies from the Edo Period, improved them, added ingenuity, and developed world-class technologies. Needless to say, the Japanese traditional technologies themselves evolved through the interaction with European and U.S. technologies. The steps in the figure represent the evolution of the Japanese traditional technologies. 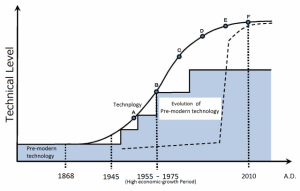 The curve denotes the history of comprehensive Japanese modern technologies. What developing countries require now is not the cutting-edge, advanced technologies of Japan, but the specifications of technologies that are easy to use and maintain. In the figure, such technologies correspond to those adopted in Japan in the 1980's. When I asked a friend who was working for a plant maker outside Japan, “Please show me the drawings of a plant used in the 1980's,” he replied, “No.” The PC of my friend and other engineers in their 30’s and 40’s contain only the drawings of the latest technologies in the 21st century. To obtain the drawings used in the 1980's, you have to search the dusty shelves in a reference room. The localization of specs in developing countries means the return to the technological level of predecessors. Young engineers of the present age learned how to use computers in high school and university. The predecessors of 50 years ago evolved their devices manually. For the young engineers who lack the experience of manual production, it is physically and mentally difficult to produce things manually with localized technologies. If they can do manual production, this will surely please users and consumers. Maintenance can be conducted by users and consumers by themselves. This would lead to the cultivation of the new market. I realized again that it is essential to put ourselves in the shoes of users in order to develop products. On January 18th, The Asia-Pacific Water Forum (APWF), for which JWF serves as secretariat, organized the 20th Governing Council Meeting with support from Singapore PUB . The meeting was chaired by Mr. Ravi Narayanan, Ms. Changhua Wu, and Prof. Simon Tay in their capacities as Chair and Vice-Chairs of the Governing Council of the APWF. The meeting was attended by the total of 23 members from 17 organizations. In addition, another four organizations joined the discussion through video conferencing.